COX'S BAZAR, Bangladesh — Rohingya insurgents, whose attack on Myanmar security forces last month triggered savage military reprisals, declared a monthlong truce Sunday as refugees continued to flood across the border into Bangladesh only to face scant basic resources, hunger and illness. The Muslim insurgents of the Arakan Rohingya Salvation Army issued the truce statement on its Twitter account and urged Myanmar's government to reciprocate in order to assist all victims regardless of their background. The government did not comment immediately. The rebels, who say they're fighting to protect their minority members against government-sponsored persecution, launched their first known attacks last October and again on Aug. 25. 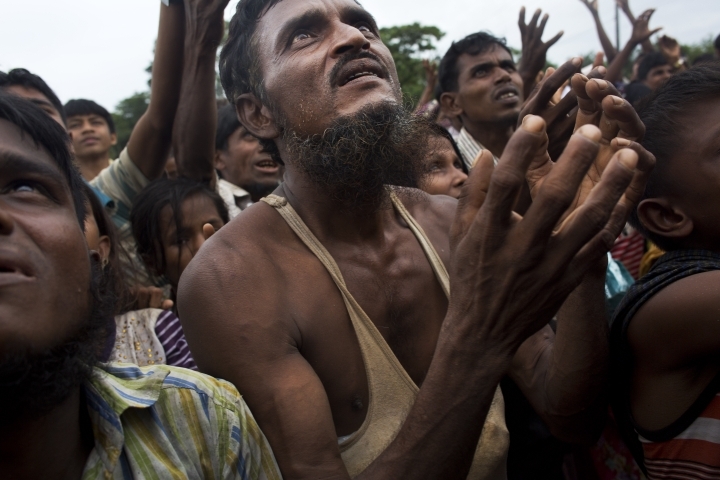 According to Rohingya refugees, the military responded with indiscriminate killings, burning entire villages and forcing tens of thousands to flee. The government said most of the 400 dead were "terrorists." 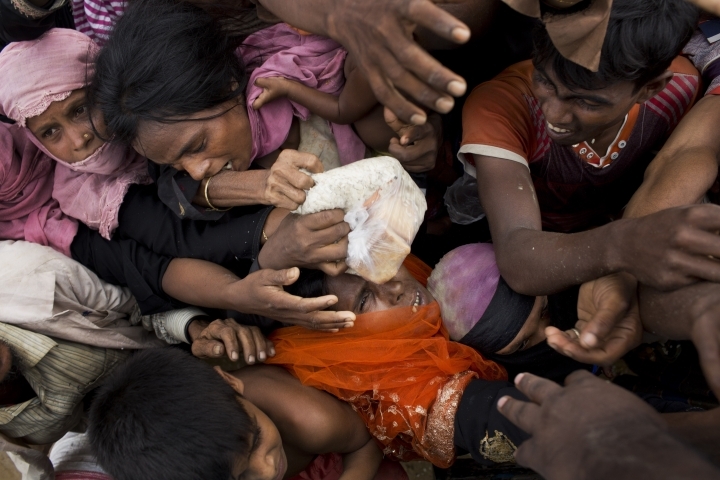 The U.N. said Saturday that an estimated 290,000 Rohingya Muslims have arrived in the border district of Cox's Bazar in just the last two weeks, joining at least 100,000 who were already there after fleeing earlier riots or persecution in Buddhist-majority Myanmar. The number was expected to swell further, with thousands crossing the border each day. Fights were erupting over food and water. Women and children were tapping on car windows or tugging at the clothes of passing reporters while rubbing their bellies and begging for food. Health experts warned of the potential for outbreaks of disease. "More and more people are coming," said UNHCR spokeswoman Vivian Tan. With camps already "more than full," the new arrivals were setting up spontaneous settlements along roadsides or on any available patches of land. Within the camps "we are trying our best, but it is very difficult because every day we are seeing new arrivals" with nowhere to go, Tan said. 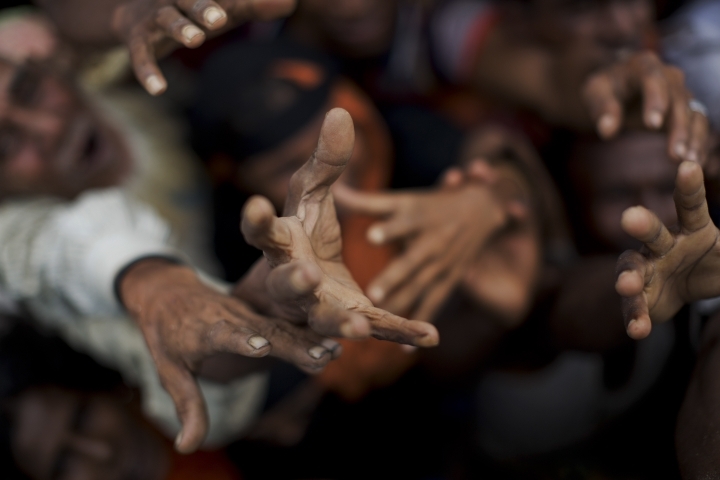 Many of the newly arrived were initially stunned and traumatized after fleeing the violence. They are now growing desperate in searching for food distribution points that appeared only in recent days, passing out packets of biscuits and 25-kilogram (55-pound) bags of rice. One aid worker who asked not to be identified because they were not authorized to speak to the media said "stocks are running out" with the refugees' needs far greater than what they had imagined. "It is impossible to keep up," she said. At one food distribution point, women were volunteering to help keep order by tapping people with bamboo sticks to gently urge them back in line. Weary women carried infants in their arms while clutching other children to their sides, afraid they might be separated in the crowds. One 40-year-old man, faint with hunger, collapsed while waiting and could not stand again on his own strength when others tried to help him up. They drizzled water between his lips in an attempt to revive him, to no avail. At one camp, a mobile clinic set up for the first time Saturday had already seen 600 patients by the afternoon. 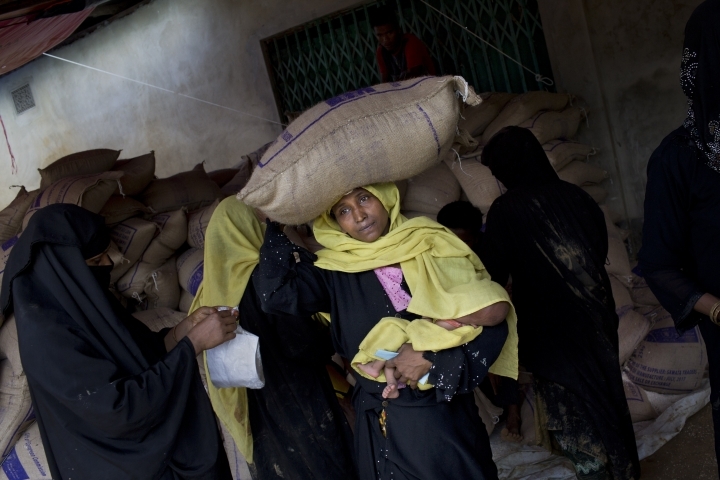 Patients, mostly children, were coming in with severe diarrhea, fungal skin infections, ear infections and high fever, said Nasima Yasmin, the director of the clinic run by a well-known Bangladesh health group. Yasmin said their work was barely sufficient given the camp's scale and requirements. "We need deep tube wells so that there is clean water and people can clean themselves. Also toilets are needed," she said, adding that the sheer number of newcomers raised fears of a serious outbreak of disease. Refugee camps had already been filled to capacity before the influx. 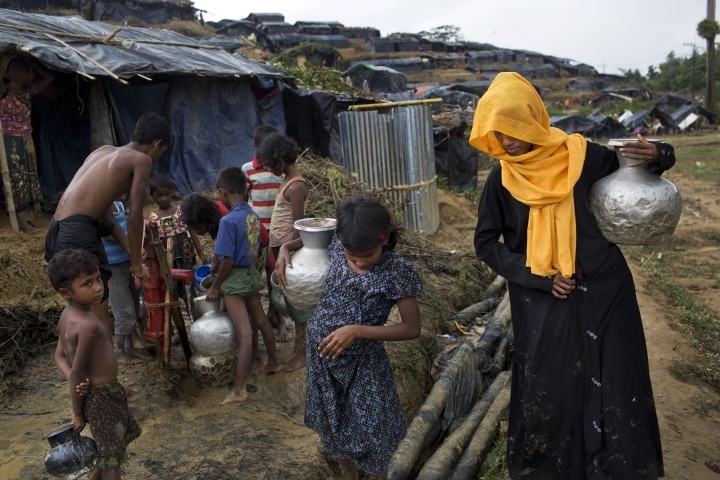 Makeshift settlements were quickly appearing and expanding along roadsides, and the city of Cox's Bazar — built to accommodate only 500,000 — was bursting at its seams. There was an urgent need for more temporary shelters, Tan said. "We are seeing the mushrooming of these very flimsy shelters that will not be able to house people for too long," she said. 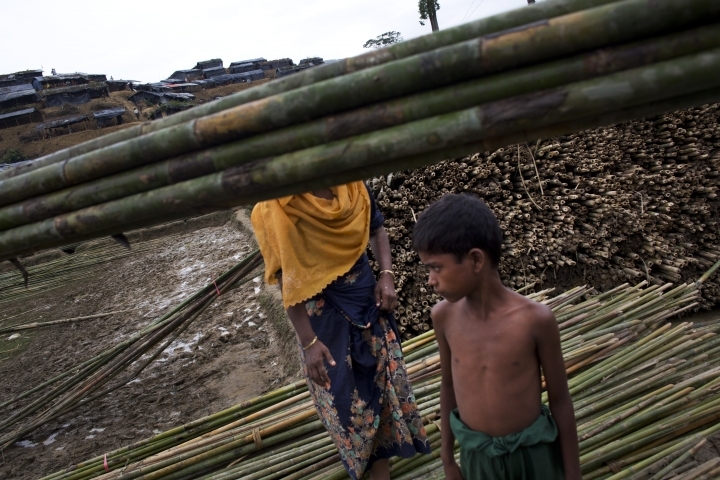 The U.N. has asked Bangladesh authorities to make more land available so they can build new relief camps. The U.S. State Department said in a statement Saturday that it was "very concerned" about the situation and praised Bangladesh for its "generosity in responding to this humanitarian crisis." 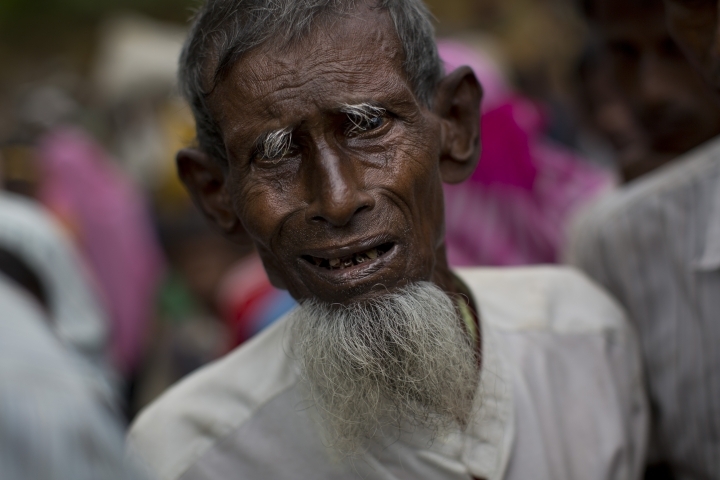 It's not known how many Rohingya remain in Rakhine state. Previously the population had been thought to be roughly 1 million. Journalists in Rakhine state saw active fires in areas Rohingya had abandoned, adding to doubts over government claims that Rohingya themselves were responsible for setting them. Associated Press writers Nirmala George in New Delhi and Katy Daigle in Bangkok contributed to this report. Follow Muneeza Naqvi at www.twitter.com/mnaqvi10 .